I really like this resource posted by Concordia Publishing House on their Facebook page as a free download. Each day of the month includes a quick activity, question, or faith topic for discussion. 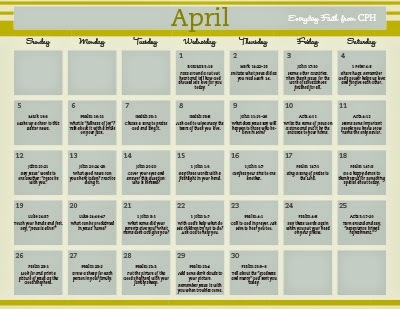 This calendar is an excellent way to spend time each day talking about faith. Keep it on the dining room table and start dinner with a faith discussion. Stick it in the visor of your car and talk about faith on your way to school. Or, tuck it under your child's pillow to end the day with thoughts of God's love. These little conversations will integrate faith into each day in a beautiful way that teaches, encourages, and guides your child to turn to scripture.